Entries for the Second Annual Upper Peninsula Nature Writing Contest were received from across the Upper Peninsula –Munising and Ironwood, Copper Harbor and Newberry, Hancock, Engadine, Naubinway, Lake Linden, Chassell and Wakefield to Rapid River, Manistique, Marquette, Ishpeming and many towns in between. The Nature Writing Contest is sponsored by North Country Publishing of Skandia (Lon and Lynn Emerick) and the Falling Rock Café and Bookstore of Munising (Nancy and Jeff Dwyer) and was judged by five of the Upper Peninsula’s resident writers. The contest winner (!) was Kathleen Heideman of Marquette, with her entry Attending Every Tiny Funeral. 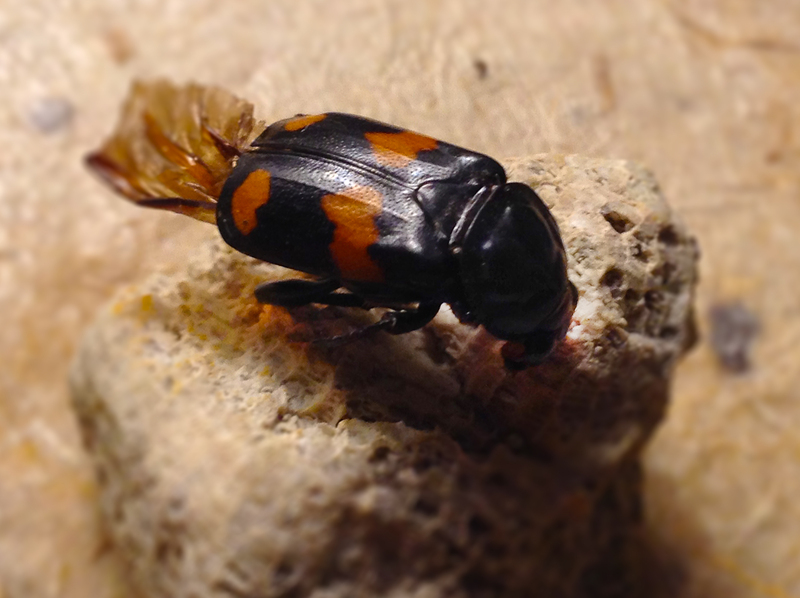 * Probably Nicrophorus orbicollis (or possibly vespilloides). The contest’s First Honorable Mention award went to Amanda Rogers of Copper Harbor for Whichever Season is Next. Contest judging resulted in a tie for Second Honorable Mention: Thomas Hoogterp of Engadine for his entry All in a Day’s Walk and Rachel Mills of Marquette who submitted Fiddleheads and Leeks. Noah Hausmann of Gwinn is the Third Honorable Mention winner for his entry: Can’t Wait to Get Back Home. Honorable Mention winners will be awarded gift cards from the Falling Rock Café and Bookstore and Gwen Frostic nature journals during September Nature Writing Evenings. Evenings of U.P. Nature Writing, sponsored by North Country Publishing and the Falling Rock Café and Bookstore will be held on September 11th at 7:00 p.m. at the Falling Rock Café & Bookstore in Munising and also on September 24th at 7:00 pm in the Community Room of the Peter White Public Library in Marquette. The Marquette Arts and Culture Center is co-hosting the Library evening event. All entrants from the 2014 Second Annual Nature Writing contest have been invited to read their work and talk about nature writing with those attending. Members of the public are also invited to read their own nature writings; a list of favorite nature books will be available as a handout.